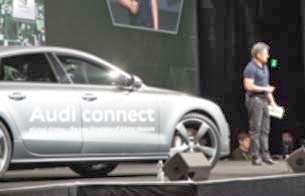 NVIDIA highlights the self-driving Audi via NVIDIA powered graphic processor, as mentioned in their official blog website. Audis driving themselves. Artificial brains powering web sites. Graphics cards boasting the power of entire data centers. It’s clear at this week’s fifth annual GPU Technology Conference that visual computing is changing the world. Graphics were a PC feature when NVIDIA was founded two decades ago. Today, it’s at the heart of gaming, visual effects and professional design, among others. A crowd of more than 3,500 heard NVIDIA CEO Jen-Hsun Huang describe how it’s front and center, as well, critical to whole new fields like computer vision and machine learning. Making this possible is the enormous growth of CUDA – a tool invented by NVIDIA that allows massively parallel graphics processors to crunch data at exceptional speeds. It’s enabling breakthroughs that will fundamentally change how we interact with computers and how they, in turn, respond to their surroundings. “CUDA is everywhere. Visual computing matters more than ever before,” said Huang, while crossing in front of the massive 120-foot screen, the size of one and a half tennis courts.